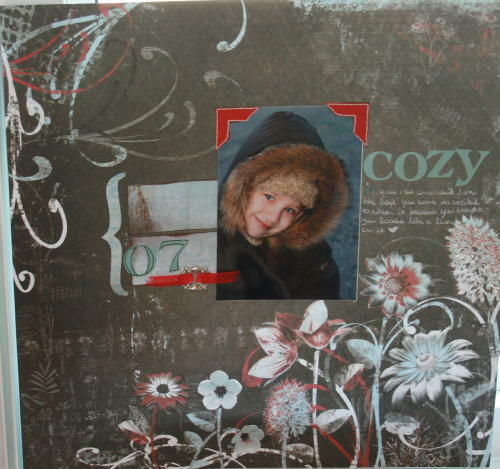 The first layout I completed with the Storytellersclub.com Scrapbooking kit is called "cozy". I always start by placing the picture or pictures onto the paper.Then I cut 2 strips of patterned paper, inked them and glued them by the picture. I added the sticker bracket, the 07 stickers(which I outlined with a pen) and I threaded a small piece of ribbon through the embellishment. On the other side of the picture, I added the title and the journaling.I tried using the pen that was included in the Storytellers Scrapbooking kit, but when I opened the package the pen was open and completely dried out.